Today will be the first holiday in over 30 years that I will spend without Greg. Ironic that the holiday is Thanksgiving. How can I possibly be thankful today?? Do people really expect me to be thankful today?? Surely everyone would understand if I just stayed in bed all day and cried about how hard my life is and how unfair it all is. Wouldn’t they?? Wouldn’t He?? Wouldn’t God understand my pain and my sorrow and my lack of thankfulness? Yes, He understands but….this is not what He wants. This is not His will for me. The Word says we are to “give thanks in ALL circumstances; for this is the will of God in Jesus for you.” His desire, His will, His command is that I give thanks in ALL circumstances. Hard to say; even harder to do. But, as I sit here pondering God’s Word..I know that’s what I must do. That’s what I WANT to do! It will just be a little more difficult this year. So, I’ve asked the Lord to remind me of what I have to be thankful for. And you know what…He is doing just that!! How can I sit here and whine and cry about my life, about my loss, when He WILLINGLY gave up His one and only Son so that I could have eternal life?? When Jesus WILLINGLY took on my sin and my shame on the cross and suffered and died for me? That puts things in a different light and I realize that though things are hard for me this Thanksgiving, I still have so much to be thankful for. I am thankful for my children. Although, it breaks my heart to see them going through such a hard time with losing their Dad, I am so thankful that they are with me as I go through this time of grieving. I am thankful for who they are and who they are becoming…..beautiful, strong, loving, caring, bold, lovers of Christ. I am thankful for my family members, who grieve during this season with me. We have a huge hole in our family, but we draw strength and encouragement from one another. I am so thankful for the way my family has supported me and been such a help to me and the kids over the past six weeks. What do people do without family??? I am thankful for my friends, my church family, my homeschool family, my Delta family and my neighbors. What a blessing all of them have been to me. Meals, phone calls, cards, financial gifts, help with cars, help with yard work, garbage pick up service, bills paid, help with insurance and other details, and just time spent being with me and the kids. How very blessed I am. How can I not be thankful??? I am thankful that the Lord provided a sweet start to our Thanksgiving last night. Lots of laughter and fun as the kids and I cooked together, played games together and just enjoyed being together. And we also got a surprise visit from some sweet young friends that delivered Starbucks to us! Now that I’ve gotten started, I could go on and on listing out the many things that I have to be thankful for. But I’ll end by saying that I am so thankful that Greg was a part of my life for 30+ years! I am thankful that he is the father of my children. I am thankful that I KNOW where Greg is now….I don’t have to wonder. He is in heaven with his Heavenly Father. I am thankful that he is no longer experiencing pain or weakness or sickness. I am thankful that he is not dead…he is more alive today than he has ever been!!! I am thankful that my children and I all know Jesus and have accepted Him as our Lord and Savior. Because of this, we know that one day we too will be with our Heavenly Father…..our earthly family reunited in our Heavenly home!!! What a promise! What hope! Again, how can I not be thankful??? Yes, today will be a hard day. And so will tomorrow and the next day and the next day. Every day without Greg will be hard. But, the Lord is faithful to His promises. He promises that He will be a Father to the fatherless and a protector and defender of the widow. He is doing this and I know that He will continue to do this! Happy Thanksgiving to each of you! Be thankful and ENJOY your families! Love When God Speaks To My Heart! After the post that I made last night, I got up this morning and this is my devotion for today. It’s from Jesus Today. Lean on, trust in , and be confident in Me. The more challenging your life circumstances, the more you need to affirm -and lean on- your confident trust in Me. During difficult times, your natural tendency is to rely heavily on your own understanding. However, your human understanding is not up to this task; it will fail you time and again. You have every reason to be confident in Me. I am the Creator and Sustainer of the universe, and I am in charge of every aspect of your life. Because the world is in such a fallen condition, it may seem as if I’m not in control. I could end all suffering instantly – by destroying the earth and taking My children home – but I am waiting to bring many sons and daughters to Glory. So take heart as you live in this broken world, believing that My eternal purposes are being worked out through your difficulties. Your troubles are part of My majestic Master Plan, and they are achieving an eternal Glory that far outweighs them all! So cool how God just confirms what I’m feeling through His word and speaks straight to my heart! Another cool thing is that I’ve been studying this particular verse over the last couple of days and the Lord has really been teaching me so much. Maybe I’ll share some of what I’ve been learning in the next day or so! He is faithful and He is good! Our lives are filled with “firsts.” I think back over my life and have sweet memories of my first best friend, my first car and my first job. I’ll never forget my many “firsts” that were shared with Greg. My first love, my first kiss, our first date, the first time that he told me that he loved me, our first home. I remember the first time I found out I was pregnant, (and the second and third and the fourth! ), the time I delivered our first child, (and the second and the third!). The first time we learned that the baby that I was carrying inside was no longer living. The first time we heard the words that our second child wasn’t breathing when she was born. The first time we heard the doctor say that our son might have cystic fibrosis. The first time that we realized that our son had been healed of cystic fibrosis! I remember our babies’ first smiles, first laughs, first steps. I remember the first time each of our children said that they wanted to ask Jesus into their hearts. I remember the first time I looked across the room at my husband and realized that he truly loved me as Christ loved the church. And I remember the first time I heard the words on the phone, “You’re husband has malignant melanoma.” My “firsts” from my past are a mixture of good and bad. A mixture of elation and hurt, excitement and heartbreak. My present is also filled with “firsts”. unfortunately, my “firsts” these days are filled with pain. The first time I had to see my husband so sick and weak and in so much pain. The first time I realized that things were not looking good for Greg. The first time I had to call my children and family to tell them that the doctors said that Greg probably was not going to make it. The first time I walked into the room to see my husband in a coma and on a ventilator. The first time I had to say goodbye to him, knowing that it was not a “see you tonight” kind of goodbye. The first time I had to walk into my house, knowing that my husband would never be here again. The first time I signed a blog post Sandra, Katie, Emilie and Jacob. The first time the phone rang, and I heard his voice on the answering machine. The first time I had to answer “widowed”, when asked my marital status. The first time we went out for a family dinner without our husband/father. The first time we took communion at church as a family of four, rather than a family of five. The first time I woke up in the morning thinking I heard Greg in the bathroom getting ready for work….only to remember that he’s not here. The first time the phone rings and I think, “Oh, that’s probably Greg.” So many firsts….so much pain. And I know that I have many more “firsts” in my future. Many of these firsts will be bittersweet. When Jacob graduates high school and begins college…and Greg’s not there. The first time we celebrate Thanksgiving and Christmas without Greg. The first time we take a family vacation without Greg. When we celebrate the weddings of my children and Greg’s not there. When I am an “empty nester” by myself. When birthdays and anniversaries roll around that make me sad. The first time I become a “single” grandparent. So many sweet, but painful firsts still in my future. But…..praise God I don’t have to go through these “firsts” by myself, nor do my children! The Lord promises us that He will never leave us or forsake us! That is good news in the midst of painful “firsts!” He also tells us that He will be a father to the fatherless and a protector and defender of the widow. Not only that, but my God promises me glorious “firsts” that far outweigh the pain of these other firsts. I think about the first time that we will all be reunited again…me, Greg, Katie, Emilie, Jacob and the baby that I lost! The first time I step from this earth into my eternal home! The first time that I see my Jesus, the One that I love so much, face to face!! What a “first” that will be! So, I press on through the painful “firsts” and cling to the promises of the glorious “firsts” that are yet to come! I love God’s Word and how it brings me comfort, strength, assurance and reminders of His love and care for me! These are some of His words that spoke to my heart this morning. I pray that if you are going through a difficult time in your life, that you will also find comfort and strength in these verses. The days are hard, but God is good…..always. Today, instead of sharing my own writing, I am sharing a post that my daughter, Katie, posted on her blog. She has been able to express so beautifully some of the things that have just been too painful for me to share. I am so very thankful for all three of my children! They are such blessings to me, especially during this time of grief and sadness. I love you Katie, Emilie and Jacob! It’s been a little over three weeks since I lost my dad. On the one hand, it seems like just yesterday that I was walking in the door, going to give him a hug and a kiss. On the other hand, it seems like an eternity. My days go seemingly quick, as I’m busy with school, work, and friends. But the nights? Sometimes the nights are hard. Sometimes the nights are horribly, painfully hard. In the quiet hours, that’s when the darkness seems to creep in. Flashbacks come, images burned in my brain that I just can’t seem to erase. I walk through the ICU hallway in my mind, down to that horrible room filled with machines, lights, beeping, whirring. I can still hear the sobbing, see the tears, feel the cruel heartbreak lacing the very air. I breathe it in. It consumes me, consumes all of us. My voice plays over in my mind, choking out my final words to my dying father. “I love you, Dad. You were the best I could have ever asked for. Thank you. I love you, I love you, I love you.” I hear the deafening silence following his unresponsiveness. I watch as my mom, sister, brother, grandparents, aunt, uncle, cousins, and friends all enter that ominous hallway, taking their turns to say their last words. I lay my head against Dad’s chest, his heart beating slower and slower. I hold his hand, squeezing, desperately trying to cling to every last bit of life. I stare at my family’s faces. I see my mom, watching the love of her life take his last breaths. I see my siblings, bawling as life fades. I see my family, surrounding a son, brother, and uncle that they love. I hear the voice of a fourteen year old boy with his hand on his dad’s chest and tears in his eyes say, “Mom, his heart stopped beating.” The room goes cold. A numb ache consumes me. Just like that, life is snatched away. Nighttime. Darkness. Scenes replay, flashbacks come. The stomach churns, a nauseous, gut-wrenching grief. A knife, stabbed deep. Salty tears burn and the wounded heart aches. Grief, pain, death- they are no respecter of persons. Yet, in a way, I welcome it. Not that I would ever choose this for myself, but this soul-searing hurt… maybe this is what it feels to be human. To know helplessness and brokenness, to desperately hope that there’s something outside of me, something bigger than myself. The pain reminds me of just how tragic sin is and death reeks of something absurdly unnatural. It tears at my very soul, screaming, “this is not the way life was intended to be! It’s not right!” And it’s not. Nothing is right about cancer or death and it certainly is not the way life was meant to be lived. Pain reminds me of that truth. Pain leads to desperation; a dark, overwhelming desperation that crushes all of humanity. Soul-wringing hurt reminds me that I and the rest of humanity are on level ground, a battle ground littered with broken hearts, crushed dreams, and desperate souls. It is only once I begin to grasp this desperation that I can truly appreciate the hope offered in the Gospel. This is a song that the Lord has been using to truly speak to my heart and soul. Refuse to ignore the pain. Embrace it and worship God in the midst of it. Today was an exciting day for Jacob! Some sweet friends of ours from church, Kevin and Val Burrell, came by this afternoon to make a personal delivery to Jacob. 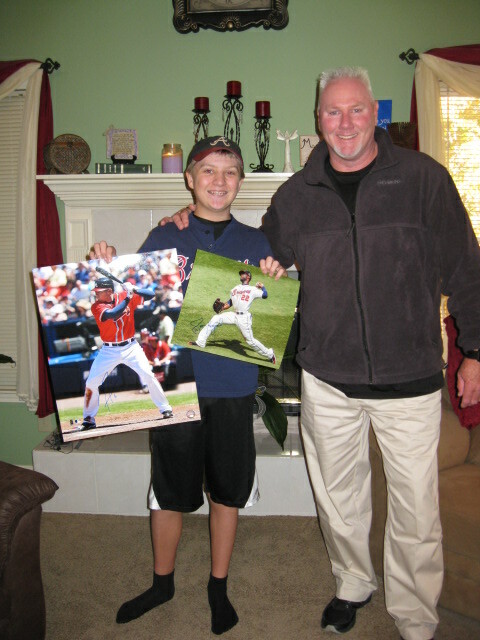 Kevin used to be a MLB player, playing for the Royals, the Mets, the Giants and the Red Sox. 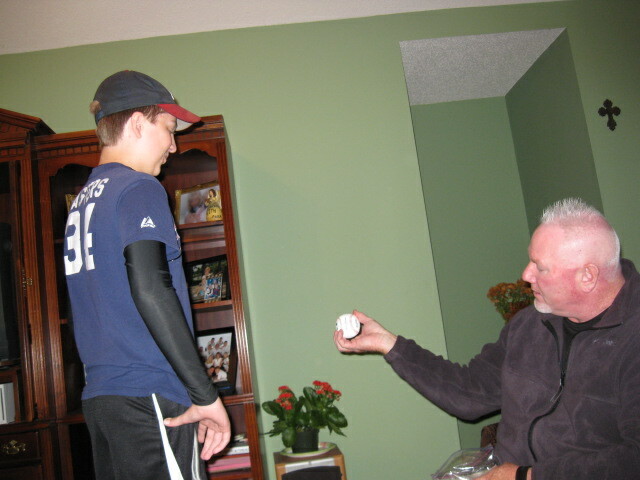 He now is a scout for the Chicago White Sox. 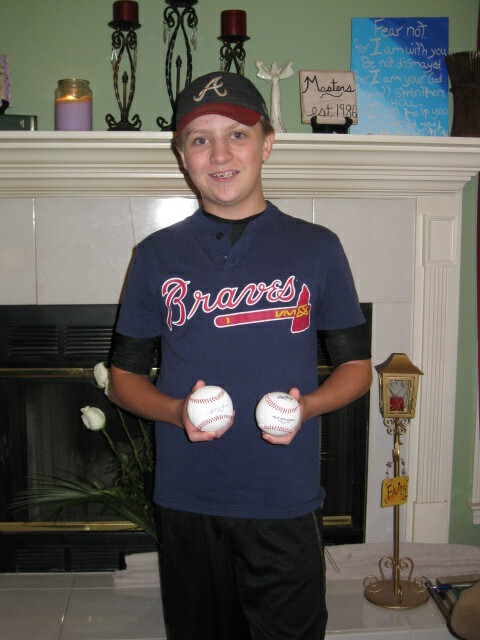 After hearing that Jacob was a big Braves fan and that he loved going to games with his Dad, Kevin made a few calls to some of his friends. 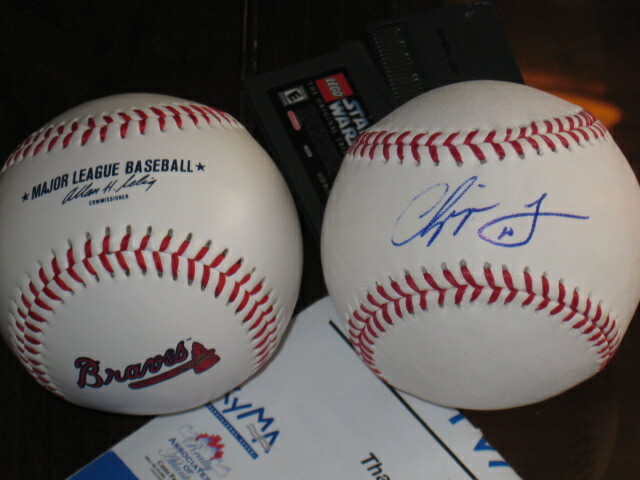 Today, Kevin and Val came over with an autographed picture of Jason Heyward, an autographed picture of Freddie Freeman, a signed baseball by Chipper Jones and another official Major League baseball with the Braves logo on it! How cool is that???? Jacob is beyond excited! What a great thing for Kevin to do for him! 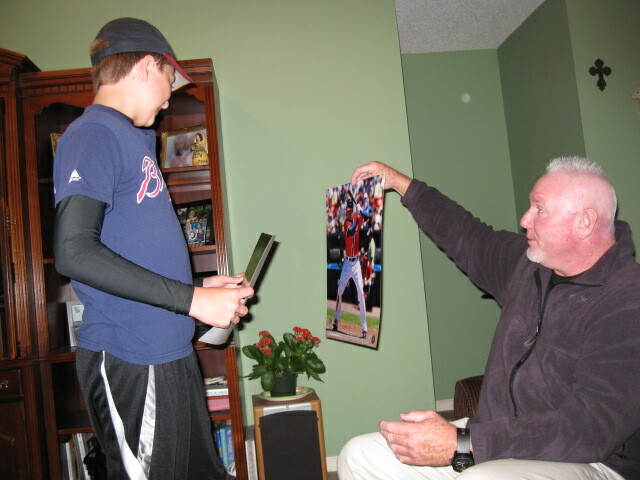 Kevin also told us today that Jacob has something in common with Freddie Freeman. Freddie’s mother died from Melanoma when he was 10 years old. I found an article online that said that she was initially diagnosed when Freddie was four years old. She had been in remission for almost five years. They had already planned a 5 year celebration dinner, when she was admitted to the hospital for appendicits. A routine chest x-ray showed that the melanoma had come back in her lungs. Within seven months, she had died. Freddie is now very outspoken about the importance of sun safety and about raising money for finding a cure for melanoma. Melanoma is such an ugly disease and affects so many lives. I pray that one day the “miracle drug” will be found that puts a stop to this deadly disease. 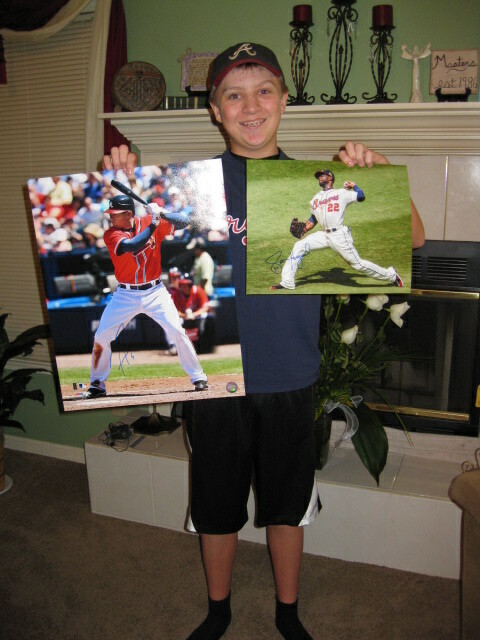 We just want to say a BIG thank you to Kevin, Val, Jason Heyward, Freddie Freeman and all the others that made it possible for Jacob to receive these special gifts! Yesterday Jake was having a bit of a hard day and I was thrilled to see him so happy and smiling today! Thank you all for blessing my boy! A good word for me (and maybe you!) this morning. The days are hard, but God is good!